As the 19th Communist Party of China (CPC) Congress closes, Xi Jinping, his vision, power and actions are consecrated through the enshrinement of Xi’s thoughts on “Socialism with Chinese Characteristics for a New Era” in the CPC constitution. Notably, this means that the Chinese political authorities declare a commitment to “providing a better life” … to Chinese people. The ways and means to achieve Socialism with Chinese Characteristics for a New Era and this better life are numerous, as described in the 3.5 hours speech of Xi Jinping and aim at building a country by 2050 that is “‘prosperous, strong, democratic, culturally advanced, harmonious and beautiful,’ incorporating ‘Beautiful China’ into the development plan”. Meanwhile, the Chinese also are at pain to emphasise that their new vision and commitment will too bring happiness and prosperity to the whole world. Some commentators, such as the Forbes’ article selected as signal below, point out nonetheless the very real risks to foreign companies, and the difficulties entailed by forced technological transfers, for example, or by a globalization and free trade that China promotes for others, but which is applied differently when foreign firms want an access to the Chinese Market. We may thus wonder if China will not oppose the financialization of the economy and, as a result, the “actors of global finance” – those actors promoting and benefitting from extreme financialization – to the least within China. Other signals prior to the CPC Congress would point in a similar direction, as exemplified by the August article “China’s Financial sector must resume role of serving real economy” (see below). 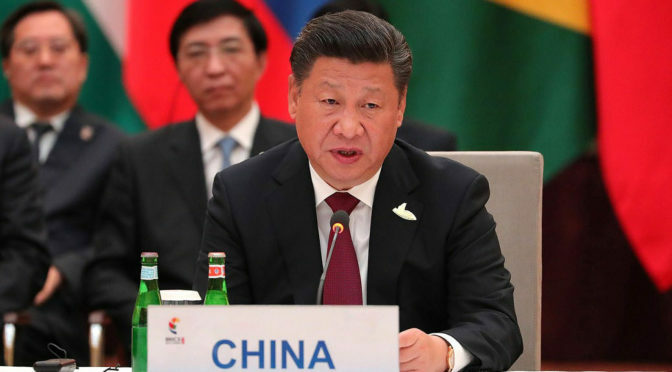 This issue – China vs Global Finance – must be put on the watch, as the war will most probably be momentous considering the means of each type of players and the mammoth stakes. It will also be necessary to envision that it will likely take place on a global scale and not only within China, as the actors promoting global financialization are indeed global. Interestingly, one of the possible impacts of this possible war could be an improvement of Western economies and of the lives of Western working and middle classes. Indeed, Chinese development has also contributed – among others – to the impoverishment of millions of workers in “advanced economies” and to the dwindling away of the Western middle class, which, in turn favoured, among others, the rise of populism. Thus, if China wants sincerely to be seen as a benevolent power, worldwide, it must also pay attention to see this adverse trend stopping, yet without endangering its own rise and objectives. If we look for other factors that stop the West to recover from the financial crisis and to see prosperity for all starting again, rather than seeing inequality rising perpetually, we find indeed the financialization of the economy, the absence of investments because returns are never high enough in the real economy, predatory finance and its buy-backs of shares rather than proper productive corporate policies, etc. As a result, we may wonder if the possible war China could be starting for the real economy would not indeed derail the current financial predicament into which the world and more particularly the West lives. As battles take place, the financial world will have to change, even though the various faces these evolution may take still need to be envisioned. We may thus be warning, for once, about an opportunity, save for the proponents of predatory finance. As General Secretary of the Communist Party of China (CPC) Central Committee Xi Jinping delivered a speech at the opening session of the 19th CPC National Congress on Wednesday, a new paradigm of economic development and governance was announced that will have a deep impact on China’s future in the 21st century. The relationship between the real economy and the financial sector has always been the core subject of macroeconomics. In essence, positive interactions between the two are not only the basis of national financial stability and security, but also the foundation of sustainable development of the national economy and even the world economy. An amendment to the Constitution of the Communist Party of China (CPC) was approved Tuesday, making Xi Jinping Thought on Socialism with Chinese Characteristics for a New Era as a new component of the Party’s guide for action, according to a resolution of the 19th CPC National Congress. In many other countries, serving the people is an empty promise, but in China people are precisely the focus of politics. It is their needs that form the entire focus of all policy. This is socialism. To build a better life is the Party’s commitment to the people in a new era. Using the the twice-a-decade Communist Party Congress as his platform, President Xi Jinping has laid out his sweeping plan to make China a leading global power in influence, innovation and military might by 2050. Hyperglobalisation’s disproportionate effect on the distribution of global wages, explains much about the rising protectionist sentiment. Featured Image: Xi Jinping, BRICS leaders meeting, 7 July 2017, Kremlin.ru [CC BY 4.0], via Wikimedia Commons.